Our friends at GRIT, the makers of the revolutionary Freedom Chair, believe that we all go further when we go together. Call it collaboration or teamwork or cooperation; at the end of the day, we can accomplish so much more if we work together. And just as we would work together on the trail to reach the top of the mountain, we ought to work together to make sure everybody has the mobility equipment they need. “In a country that values people who pull themselves up by their own bootstraps, and especially for a stubbornly independent personality, asking for help is hard to do. However, a little help can open doors to experiences not otherwise possible,” GRIT Freedom Chair Trailblazer Jenny Schmitz explains. We’ve seen wonderful stories of communities coming together to support each other, from Gofundme campaigns to help someone raise the money they need to purchase adaptive equipment, to community-wide efforts to make trails and facilities more accessible. Here’s a few of the success stories, courtesy of GRIT, that we hope will inspire your community as well. When Cub Scout Pack 42 in Slidell, LA realized that one of their members, Jayden, wasn’t able to join his troop on their weekend camping trips because his regular wheelchair wasn’t up to the task, they knew that they had to do something. They created a GoFundMe page to raise the funds to purchase Jayden a GRIT Freedom Chair. Seventy-seven people pitched in and soon Jayden was equipped for his first trip to camp! GRIT is committed to bringing the Freedom Chair to as many people as possible, regardless of income. That’s why they offer 9 different ways of obtaining financing for your Freedom Chair. Jayden’s Cub Scout pack created a successful crowdfunding campaign to help him, and crowdfunding aids many people in purchasing adaptive equipment when insurance isn’t an option. See more crowdfunding examples here. The North Quabbin Trails Association (NQTA) in Massachusetts oversees a wide network of beautiful wooded trails. They’ve been mapping and rating the accessibility of their trails for years, and recently discovered the GRIT Freedom Chair. It seemed like the perfect chair to help make sure that everyone in the community could enjoy the natural treasures around them, but they didn’t have the budget for it. They reached out to the people in their community and before long were able to raise enough money to buy two chairs: one for a local veteran and another shared chair available for anyone to ride. The purpose of the North Quabbin Trails Association is to sustain and work towards outdoor trail development, maintenance and improvements, including but not limited to the restoration and maintenance of trails on land and water, proper education and safety in areas of trail maintenance and construction, and to create stewardship with other outdoor organizations, groups and individuals to further this goal. Offering trail-friendly wheelchairs to their community is one part of fulfilling their mission and commitment to their community. This year, GRIT is making it easy for friends and families to help get riders rolling in a GRIT Freedom Chair. The GRIT Gift Registry is a personalized page with a unique link that’s easy to send to friends and family when they ask the inevitable question, “What do you want for Christmas this year, dear?” Simply fill out a form, send a few photos, and they’ll make your registry and update your total as you get gifts. Special Note: If you’re thinking about getting a Freedom Chair, now is the time! GRIT just launched their holiday promotion and it’s their best sale ever. Use code HOLIDAY250 to save $250, plus get free shipping and $400 store credit toward accessories. Offer valid through December 31st. The GRIT Freedom Chair is the most versatile chair on the market, designed from the ground up to handle any terrain. From trails to grass to snow, the Freedom Chair is built for you to push yourself. Born out of research at MIT, the Freedom Chair’s patented easy-push levers reduce shoulder strain and put you in control of your mobility. Ready to hit the trails. Learn more about the GRIT Freedom Chair at www.gogrit.us or call 877-345-4748. 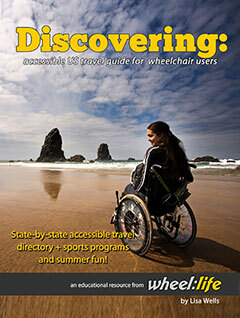 Wheel:Life provides a variety of free resources to help our readers with accessibility and lifestyle improvements. 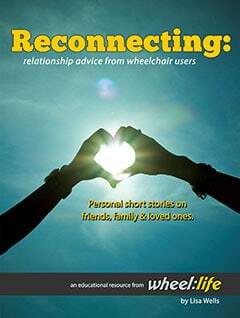 In this helpful book, you’ll review 10 brainstorming ideas for different types of fundraiser events to benefit an individual with a disability who needs assistance for medical equipment, physical rehabilitation, adaptive sports equipment or daily medical needs.